Diamond Select Toys will be having a massive presence at New York Comic Con 2018 next week. Along with shelves of products for sale, a panel, two signings and an exclusive, Diamond Select Toys will also have cases of advance prototypes on display. 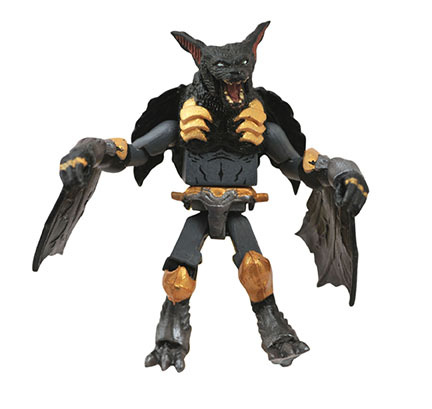 DST’s big New York Comic Con 2018 exclusive is this awesome Battle Beasts Desmodius Minimates mini figure, a fearsome black bat armed with a sword and glaive. The New York Comic Con 2018 Exclusive Battle Beasts Desmodius Minimates Figure stands 2” tall, featuring 14 points of articulation, and is fully interchangeable with all Minimates mini figures. It will come packaged in a clear polybag with hangtag, and sell for $6 exclusively at the Diamond Select Toys NYCC booth #1644.